Complex shift premiums or simple process improvement. Ceequel® Time & Attendance will remove the negativity and burden of your clocking to pay processes. Ceequel® Time and Attendance system is just one of the human resource management modules available from ELF Time and Attendance. All the modules utilise the power of the Microsoft SQL database, meaning that they can be fully integrated into existing systems, ensuring that a true client-server solution is delivered. Since you're benefiting from the very latest technology it will run efficiently over your Local or Wide Area Network. Our 30 years industry experience means that we can provide the highest level of support to our loyal client base many of whom have been with us since the very first incarnations of Ceequel®. Whilst clock cards remain a viable way of keeping track of employees there's no question that they make great demands on your time. They need writing out weekly, collecting and replacing daily and of course, there's the added hassle of the manual calculation of attended hours. All this data has to be transferred by hand to personnel records. In fact, it's been estimated that this laborious task mounts up to a staggering 18 minutes per employee per week, and that's time your business just doesn't have to waste. 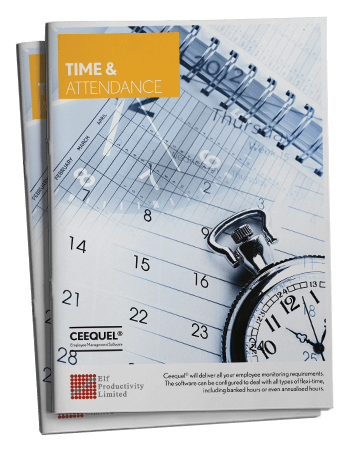 Ceequel® Time and Attendance system excels at reducing the time taken to just 2 minutes per employee. Even companies that no longer use time clocks can benefit from our software; many older systems are slow and clumsy and often didn't deliver promised results even in their heyday. Ceequel® promises to meet and exceed your expectations by granting you access to cutting-edge time management tools. View our Time & Attendance timeline to see it's usage over an average day. Reports can be then be produced by a system administrator and distributed to line management for authorisation, comment or adjustment. Alternatively, the line managers can edit directly on the screen, removing the need for hard copy prints. In addition the task of assigning reasons can be devolved to the employee via our employee self service module. Clockings, once they are read from the Time and Attendance terminals, are stored immediately and are instantly available for reference. These transactions cannot be edited, so you can be confident that the data is both accurate and secure. Copies of the transactions can be taken for editing purposes by authorised personnel who wish to override a transaction. Any adjustments made will be logged and recorded against the person who made the change. Holiday allowance calculations can be setup based upon the length of service, including pro rata for starters and leavers and a reduced allocation for part-time employees. Holidays can be configured as either days, hours or a combination of both amongst employees and to assist with the reduction of holiday cramming at the end of the year, multiple holiday years can be setup and assigned to different employees. Mass updates for bank holidays or company shutdowns can be applied to all staff or a filtered selection. Bradford Factor Reporting By utilising the Bradford Factor reporting you will be able to identify persistent short-term absence for individuals. It works by measuring the number of absences over any given period, providing a useful measure of any disruption caused. By counting the number of employees who take at least one spell of absence in the period, rather than the total number of spells of absences, the calculation gives an individual frequency rate. After all, according to recent research from the CIPD, employee absence is listed as being a 'significant' cost to around 90% of businesses. In fact on average, sickness absentees cost employers £666 per employee every single year and employee absence, in general, represents 8 working days a year lost for every member of staff; that's 3.5% of the total working time. We've been working closely with the health and safety executive to develop comprehensive software to help you to effectively administer the complexities of the working time directive. This powerful time-saving tool takes advantage of data that is already available within the Ceequel® Time and Attendance system. The reports are instantly available on screen or in hard copy form, both of which can be accessed without the need for data input. Our software has been especially designed so that you can see at a glance those employees who are close to, or have exceeded the working time rules, and you can access more detailed information on the screen by using the drill down facility. Any changes to legislation won't be a problem. The modules are flexible enough that these changes can be easily accommodated and those employees who have agreed to work above the maximum average hours per week can be highlighted and reported on independently.